If you attended Spectrum Live in Kansas City this past weekend, then you know what I'm about to say. If you didn't, then this post is for you. The event was historic, and that's no overstatement. In terms of scale, scope, ambition, and quality, Spectrum Live was the most gratifying art gathering I've ever experienced. Arnie and Cathy Fenner, the founders of the Spectrum Annual, organized this (along with their dynamite team), and they should all take several bows, with encore applause. 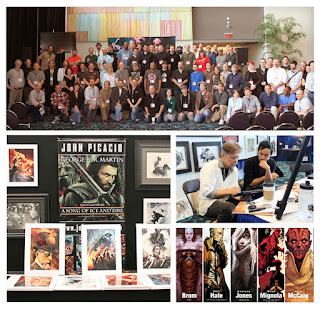 Michael Whelan said it best -- this is the convention where the artist and the art are at the top of the pyramid. Not the author, the agent, the publisher, the movie studio, the licensed property or the high-end collector. That difference sets this event apart from others. And so does the ambition for this event -- to reach beyond art as an auxiliary feature, or art for the consumption by an exclusive few – and instead toward fantastic art of all forms for an all-inclusive audience -- a gathering of all tribes, as the Fenners stated in the event's official program book. I admire and support that ambition all the way -- from traditional, to digital, to hybrids, to 3D, and all forms and modes of fantastic art. All were welcome. All were celebrated equally, and with vigor. It's impossible to list all of the quality conversations and encounters with amazing artists and artlovers that I had at this con. On the way out of Kansas City, I ran into Mike Mignola in the airport, and he couldn’t get over how all of the artists were so energized and had each other’s backs from booth to booth. I’ve seen that same camaraderie happen at IlluXCon, but the two events are designed for different scales, and this was intended for a much larger one. And all of this was happening in a room where arguably you had the most artistic talent and firepower in science fiction and fantasy, housed in one place. There are larger conventions like San Diego Comic Con and Dragon*Con, but Spectrum Live cuts away all of the other trappings, and is about the art all the way. I had a blast, and I don’t know anyone who attended who didn’t feel the same. Will an event like this happen again? Time will tell. If so, I’ll be one of the first to sign up, and dream it all over again. If you missed this year’s, and you love sf/f art – you owe it to yourself to do the same. 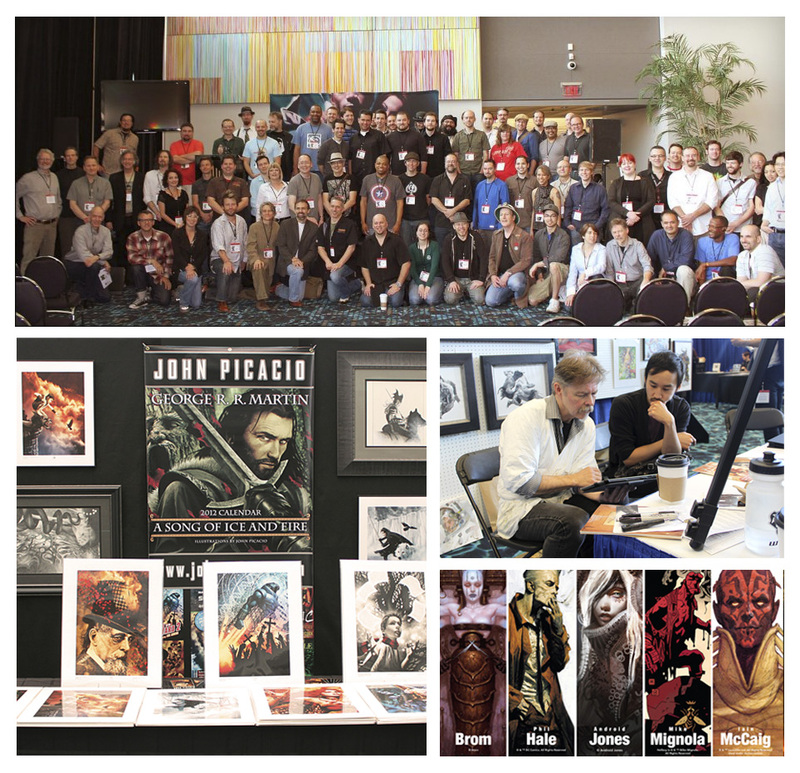 Shoutouts to Allen Williams, Stephan Martiniere, Eric Fortune, Joao Ruas, Lauren Panepinto, Kristina Carroll, Brom, Maria Cabardo, Bud Plant, Lauren K. Cannon, Zelda Devon, Jon Schindehette, Dan Dos Santos, Cody Tilson, Vincent Villafranca, Mike Mignola, Greg Spalenka, and Michael Whelan for meaningful, inspirational chats. And I know I'm forgetting people. So much amazing, and so many amazing people. Huge thanks to Carl Anderson, Jeff Smith, Sara Felix, Mair Daliessio, and Jimmy Simpson for helping me with my booth. For now, here are a few photos of SFAL 2012. You so captured it, John. "Wow!" was a word that coursed through my head the entire weekend. It is great to see you, as an artist, confirm the camaraderie that I saw as a fan. I talked about that in my first go round in trying to put this weekend's experience into words. It was apparent all weekend, but especially at the awards ceremony. You guys/gals love each other and it was such a great thing to be in the midst of all of that. Thank you so much for the kind words. It was a true pleasure to be of help and consider me signed up to help again next time. I'm still on cloud nine from this past weekend. The entire experience exceeded my expectations ten fold. I'm finding it hard to put into words what an electric vibe I felt throughout the entire weekend. From the artists to the fans their was this synergy that is hard to describe to others who weren't there. It was a pleasure meeting you in person after admiring your work for years. As for helping you out it was no problem at all and I would do it again in a heartbeat. Just to extend my SFAL experience a little bit longer was worth it to me. Carl and I both didn't want to remove our badges after the three days. We just didn't want it to end and I know you know just how we felt. It was truly a magical weekend which I hope we can repeat again one day. Take care. Carl -- Will definitely be handling that interview this weekend! Well stated John, It was really great to see you again man. You where the first artist I knew, when I walked in on Friday morning. It felt very accomodating and well placed, that you should be the one to greet Swain and I when came in. Such was the entire weekend, so much love and reverance was given to every detail and gathering. I wish I had more than one body, to be able to experience everything this magnificent was. Thank you John for a excellent encaspualtion. Look forward to seeing you again soon, my friend.